Wayne Dudych has been riding snowmobiles ever since he was old enough to start them himself. Still going strong after nearly 20 years on the trails, Louise Middlemiss is a dedicated member of the Kelowna Snowmobile Club who has not lost any of her passion for sledding. 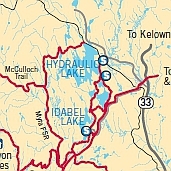 A Valentines weekend ride from Idabel to Chute Lake Resort and back home on the world famous Kettle Valley Railbed, was a highlight for a group of 46 sledders. 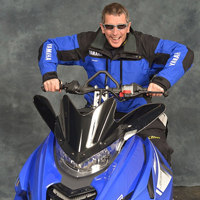 Canada’s economic action plan provides funding for central Okanagan snowmobile clubs. Sledders know how to have fun in the awesome terrain that surrounds Kelowna Included in Kelowna's wonderful snowmobiling opportunities are more than 350 kilometres of a mapped trail network. The most popular sledding area is the Greystokes, which has three chalets along the trails—all of which are maintained by the Kelowna Snowmobile Club. Scroll down on our Kelowna landing page for information on sled dealerships, destinations, snowmobiling trails, snowmobile-friendly accommodations, local snowmobiling clubs and more.